Diversity in marketing communications has come a long way in some respects, and yet… not. Susi Banks attended Ad:tech Australia recently to seek the wisdom of experts in marketing to women, over-50s, the Jewish community, and LGBTI audiences. In Australia the over-50s currently spend $200 billion per year. The lesbian, gay, bisexual, transgender and intersex (LGBTI) community spends $20 billion. Combined with the fact that women make the majority of buying decisions in Australia, does that mean a LGBTI woman over the age of 50 is a marketer’s primary target? At the Ad:tech conference in Sydney recently, a panel of experts from four diverse sectors discussed the challenges and trends when it comes to diversity marketing. 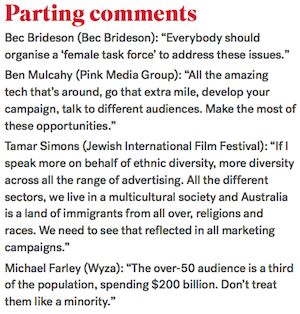 They included Ben Mulcahy, a specialist in advertising to LGBTI audiences, Bec Brideson, a leading industry voice in marketing to women, Michael Farley of over-50s publisher Wyza and Tamar Simons of the Jewish International Film Festival. Brideson said the current marketing and advertising strategy was invented in the 1950s by men, post-WWII. Women were housewives; men went to work. She said the language of advertising, such as, ‘campaign, bullseye, targets’ is very masculine as it was invented by men. “It’s not anybody’s fault this has been the inheritance; it’s just what has happened. Women are more likely to enjoy community, empathy and other qualities that marketing doesn’t embrace, where it is more about ‘my product is better than your product’. It’s a competitive, male way of communicating,” said Brideson. Asked if she thought it’s always necessary to market to women separately to men, Brideson said that although ‘gender neutral’ advertising – that appeals to men and women alike – can work, targeting can help a business that wants to get more of its share of the market. “A strategy that puts women at the centre of their marketing will outperform a gender-neutral approach because women have the economic clout,” she said. Brideson founded Venus Communications in Melbourne in 2004 to specialise in marketing to females, and today she helps businesses leverage their opportunity with the powerful female consumer. So although men may dominate positions in advertising and marketing, when it comes to buying power, they are actually in the minority. Founder and CEO of Wyza – as in, ‘a little older and a lot wyza’ – Michael Farley said that currently there are 7.9 million Australians over 50. By 2020 almost half the population will be 50 or over. Farley said what marketers don’t seem to be aware of is that the spend of this group is already $200 billion a year. Despite this, Farley said that, although age is just a number, research has shown that the over-50 market does not want to be spoken to as if they are ‘old’. They don’t want to be marketed to as seniors or pensioners. “When you get to 50 you’ve got at least half of your adult life ahead of you. It’s all about speaking to them the way they want to be spoken to,” he said. Ben Mulcahy, who’s managing director of Pink Media Group, said that although many big corporates have got on board in terms of the LGBTI sector, supporting marriage equality, there is still a long way to go. Mulcahy said it is estimated globally that one in 10 or 10% of the population is gay, bi or transgender. “Our research shows that every Australian has an LGBTI member of the family, brother or sister, aunty or uncle, son or daughter.” In terms of disposable income, this amounts to $20 billion per annum. He noted they are also early adopters of new technology. “A lot of companies such as Airbnb sponsor Mardi Gras because they know LGBTI people as a community are very quick on the uptake, very quick to use and host, and Darlinghurst – which has the highest population of gay guys in the country – is Airbnb’s most successful suburb in Australia,” he said. But Mulcahy said the danger in not getting in now before marriage equality is a reality in Australia, brands and marketers risk looking like they are just jumping on the bandwagon to make money if they wait until it happens, when they previously appeared to have no interest in marriage equality or the LGBTI market. It also could be seen as tokenism and, he suggested, Australians are too smart to be fooled by brands becoming all-inclusive only after it has become compulsory. Mulcahy said the big brands in the UK and the US are already all over this space. These include all major department stores, airlines, financial organisations, legal firms and the like. “Australia has been playing catch-up to an extent. A lot of big brands that might think marriage equality is a bit controversial will probably come charging in once it takes place. Our advice to brands is: don’t wait until it is fact,” he said. He pointed out a recent TV commercial for Westpac at a house auction with a gay couple that didn’t get the house. Mulcahy suggested that the gay couple should have got the house as they had a double income and no kids. Although, of course, there are plenty of gay couples with kids. Tamar Simons, unlike the other three diversity panellists, said marketing for the International Jewish Film Festival is not about just talking to the Australian Jewish community. The festival and distribution manager said with the Jewish population in Australia currently at 112,000, the situation is quite different, in that they are not just targeting Jewish people, but the whole of Australia, to encourage them to attend the festival. “The ethnic film festival space in Australia is huge,” said Simons. “There are 40 ethnic cultural film festivals. The French Film Festival, for example, was on recently and obviously you don’t need to belong to that race, ethnicity or religion to attend any of these festivals. They provide a window into a different world,” she said. Ad:tech panel facilitator Chris Edwards asked Simons if there was any language that needs to be tweaked when marketing to ‘white Anglo Saxon Protestants’ in order to speak to them more effectively. When asked who is getting it right in terms of marketing diversity, Mulcahy and Brideson both replied that the ANZ Bank is doing a good job – for women and the LGBTI community. Brideson pointed to ANZ’s campaign for the past six months with the hashtag #LetsMakeItEqual and Mulcahy cited the brand’s long-term ongoing sponsorship of Mardi Gras. He added that many of the other banks are also doing a great job marketing to his company’s sector as well as Facebook, Airbnb, Twitter and Google. In terms of Wyza, Farley said partners are cherry picked in the early stages of development. For example, one of the segments that has taken off very well for Wyza is vitamins and supplements. Farley said research has shown that 69% of Australians ‘believe in’ vitamins. Consequently, it has developed a strong strategic partnership with the market leader, Blackmores. Also, he said the major real estate companies such as First National Real Estate have come on board and that Wyza is in the process of finalising agreements with the major telcos. Farley said the brands and products that tend to do well are players such as Challenger, Dixons and Spring Financial, because they seem to develop a lot of information, such as ebooks for an audience that wants to get the information and read it and then they can make their decision. The panellists also said that media companies ‘get it’ when it comes to diversity, as they publish magazines targeted at males, females and myriad niche sectors. “They understand different audiences and know how to respect them,” added Brideson. Panel facilitator Edwards asked the light-hearted hypothetical: how would you market the glass he was holding to the different sectors? Mulcahy said that as the LGBTI sector tended to be earlier adopters, it may be that the glass was one that nobody else had got, that it was different. Farley from Wyza said to market it to him, the glass may have a nice beer in it. Is it necessary to have a marketing manager who also fits the demographic they are targeting, asked an audience member? Mulcahy said that if marketing managers are LGBTI they see a much better result, as they understand the audience better. Brideson gave a similar response, saying it’s the same with a woman in the role and a woman of ethnicity in some cases.